The night of Faces and Phases 2006-14 book launch came (November 7, 2014) and my Friday night schedule had been cleared. I envisioned a quiet night spent cramped in a small coffee shop, drinking free (boxed) wine in a polystyrene cup, while listening to the words of a woman I have come to love and respect. What I experienced was nothing that could be expected of a typical book launch, which speaks to the creator who has shown herself to be anything but typical or ordinary. At first I drove past Market Photo Workshop, and went to the familiarity of the Bassline parking lot to ask for directions to this coffee shop of my imagined scale. I was promptly redirected to the mass collective that I had just driven past moments earlier, thinking that it could be an interesting for an after launch jam. 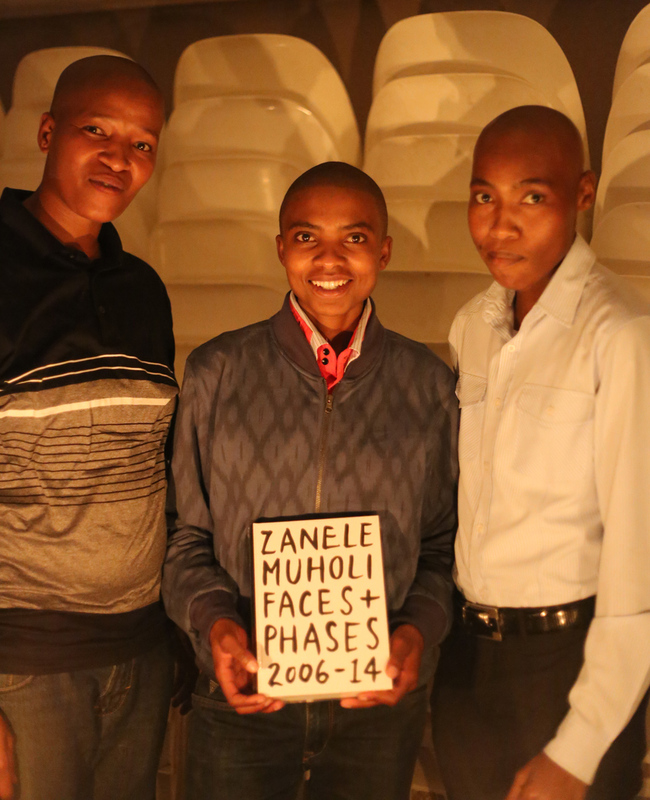 Featuring in Faces and Phases are Gazi T. Zuma, Lerato Dumse and TK Mntungwa at the Umlazi – Faces and Phases book launch on the 12th Dec. 2014. I walked into the space and the energy was beautiful. The quad was littered with all kinds of beings, all wanting nothing else to do with that elongated moment but to be there. 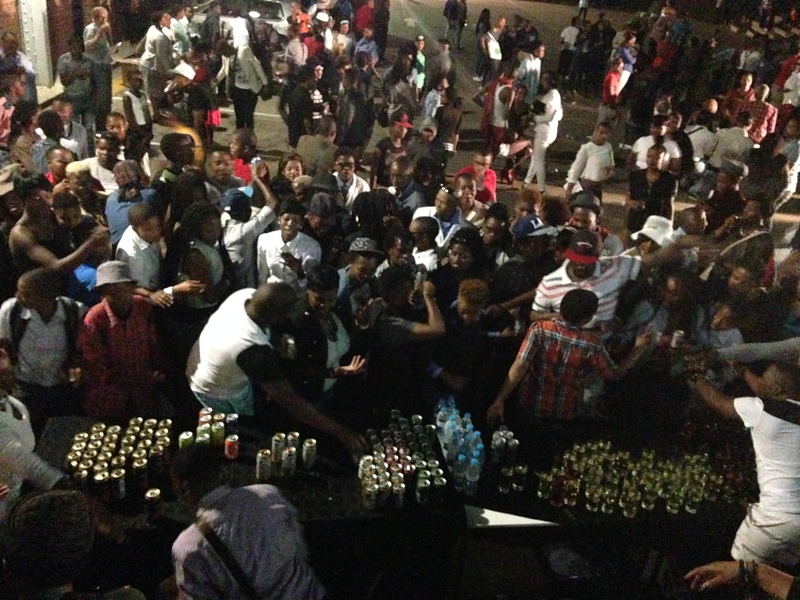 The atmosphere was infectious and I quickly found myself at home in a sea of strangers. I moved through the crowd, towards the gallery, and recognized faces that had graced the walls of Goethe Institute the year before. Also mixed into the crowd were individuals who had come to become family through interactions in the few safe spaces that have been consciously created in the realms of the LGBTIAQ existence. Picking up the book for the first time had the same mystical effect on me. I was overcome with the feeling that there was no book more important than the one I had just opened on page one. Having learnt my lesson from the night of the book launch, I placed no expectations in my imagination, understanding it was to be nothing typical or ordinary as it is a first of its kind. My mind entered into a space of complete clarity, beautiful in its purity and sheer honesty. The art of photography has always been majestic in its ability to tell the truths of its subjects with minimal interaction. Portraiture practiced so flawlessly by Zanele Muholi through her journey as a photographer takes this majesty to another level. It allows for a space where the truths of her subjects become the truths of her audience. With each page that I have been absorbed in with the individual beauty of all who grace the pages of this book. With each story, the reader (me included) has no choice but to be drawn into the existence of the ones who chose to tell their stories in words and those who chose to tell their story through their eyes. The photographs and honesty tell of people who have struggled under the undeserved scrutiny of society. They tell the story of people who have triumphed against those who oppose their natural existence. They tell the story of mothers, sisters, daughters, brothers, lovers, wives, husbands etc. who want to live and love the only way they know how, and not in the manner dictated by society. The photographs and honesty in the names and words that fill the pages of Zanele Muholi’s Faces and Phases 2006-14 tell the story of injustice in the faces of those brave enough to step up and everyone else who is denied their identity. This book has allowed me to enter the lives of many whom I thought I had figured out, by virtue of being part of the community. It took me to the depths of my own pain, strengths and possibilities. This book is one of the most important accomplishments of the LGBTIAQ community to plead the case of normalcy. As I pass on the book and leave it on my parents’ bed and you leave it in conspicuous spaces for the hetero normative identifying person, and any other person to find. I know that it will further open the eyes of allies and open the shut eyes of those ever skeptic to a nation characterized by strength, humility and beauty. This entry was posted in Another Approach Is Possible, Archived memories, Atmosphere, Book launch, Creating awareness, Expression, Faces and Phases 2006-14, Interaction, LGBTIAQ, Participants, Portraitures, Power of the Voice, South Africa, Subjects, We Are You, We Care, We Still Can with/out Resources, Writing is a Right and tagged Act, Action, activism, Activists, Articles, artists, Audience, beauty, Black lesbians, Book review, community, Education, Existence, Human beings, human rights, Living..., names and words, Photographs, Photography, Relationships, Respect, Visual activism, Voices, Words, Writing is a Right. Bookmark the permalink.